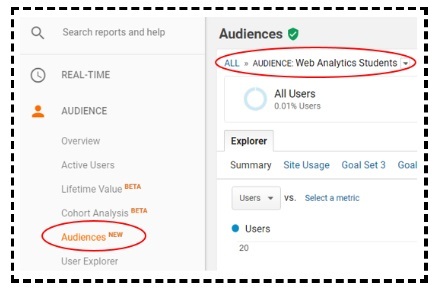 What is an Audience in Google Analytics? 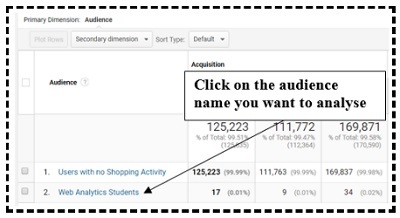 What is the Advantage of Creating Audiences in Google Analytics? 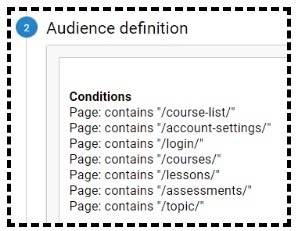 In the context of Google Analytics, an audience is a group/segment of users who showed common characteristics, attributes or experience in a particular time frame. The characteristics/attributes of users are time bound because same users can show different characteristics in different time period. For example a user may buy product X in Jan but may buy product Y in Feb or a user may visit your website on Monday via Laptop but visit your website on Tuesday via smartphone. Same user can be a member of multiple audiences at the same time depending upon how you segment and interpret the data. Search traffic audience – group of users who visited your website via search engine listings. Organic search traffic audience – group of users who visited your website via organic search engine listing. 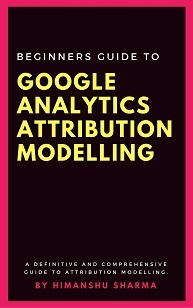 Note: Audiences in Google Analytics are just like Google Analytics cohorts. 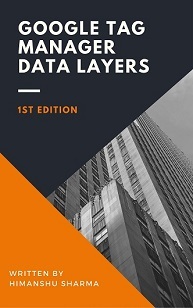 #1 You can understand the acquisition, behavior and conversion performance of particular group/segment of users who showed common characteristics, attributes or experience in a particular time frame. #1.1 How you acquired students for your training program. Like from which marketing channels or traffic sources you got the registrations. #1.2 How the students consumed course contents on your website. This content consumption is measured in terms of bounce rate, pages/session, average session duration etc. #1.3 What courses the students enrolled in and how much they spent on the purchase. This is conversion performance which is measured in terms of transactions, revenue and ecommerce conversion rate. Step-1: Define the objective(s) of creating an audience. Step-2: Decide the conditions/criteria for creating your audience. Step-4: Decide destinations to which you want to publish your audience. Step-6: Enable demographic and interest reports for your GA property. Step-7: Enable ‘Remarketing’ and ‘Advertising Reporting features’. Step-8: Decide the method you want to use to create an audience. Step-9: Create and publish the audience. Define the objective(s) of creating an audience. “We want to understand, how we are acquiring students for our training program. We want to understand, how the students are using our website and consuming the study material. 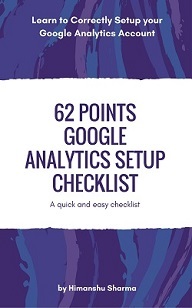 Decide the conditions/criteria for creating your audience in Google Analytics. 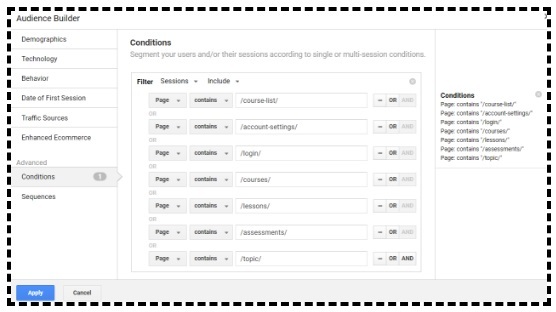 The ‘condition’ is how you segment your users and/or their sessions to create an audience. Conditions denote the common characteristics, attributes or experience in a particular time frame which will make up the audience. Decide the number of days a user remain a part of your audience. The number of days for which a user remain a part of an audience is called ‘Membership duration’. Decide the destinations to which you want to publish your audience. You would need to decide the destinations in advance because in order to publish your audience to a particular destination, you would first need to link your Google Analytics property with that destination. 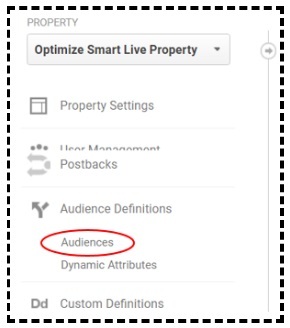 For example, if you want to publish your audience to Google Optimize, you would first need to link your GA property with Google Optimize. Similarly, if you want to publish your audience to Google Adwords, you would first need to link your GA property with Google Adwords. In fact without first linking your GA property with your Google Adwords account, you won’t be to create any type of audience in Google Analytics. 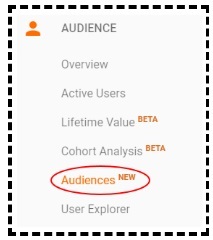 If an audience is published to Google Analytics then it is called ‘Analytics Audience’. 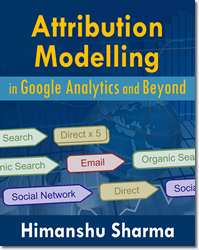 Note: An analytics audience is not available for remarketing unless it is also shared with Google Adwords or DoubleClick bid manager. If an audience is published to Google Adwords or DoubleClick bid manager then it is called ‘Remarketing Audience’. Note: The audience which is published to Google Adwords or DoubleClick bid manager in addition to Google Analytics is also called ‘Remarketing Audience’. The audience which is published to Google Optimize or Optimize 360 is called Google Optimize Audience. This is the audience which is used for experimentation. 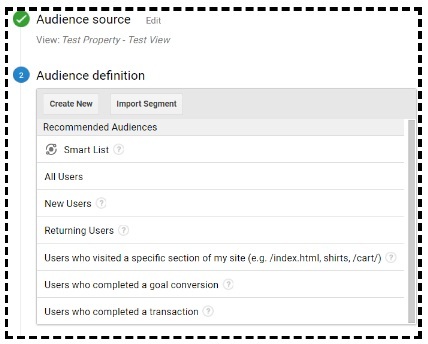 In GA user interface it is shown as an audience of type ‘optimize’ or ‘optimize 360’. Based on the destinations you have selected for your audience, link your GA property with the selected destinations one by one. 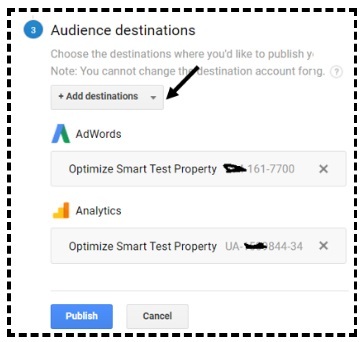 For example if you want to publish your audience to Google Adwords, DoubleClick Bid Manager and Google Optimize destinations then first link these accounts to your GA property. 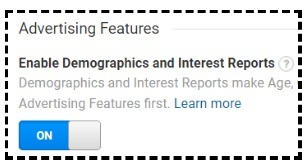 Enable demographic and interest reports for your GA property. #61. Sign in to your GA account. 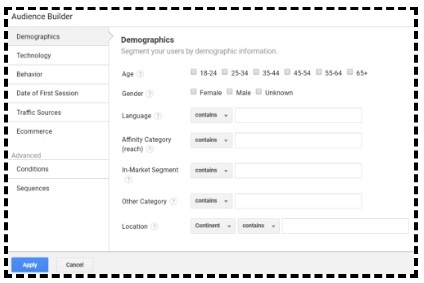 #6.2 Navigate to the property where you want to use Demographic and Interests data. #6.5 Click on ‘Save’ button. Enable ‘Remarketing’ and ‘Advertising Reporting features’. 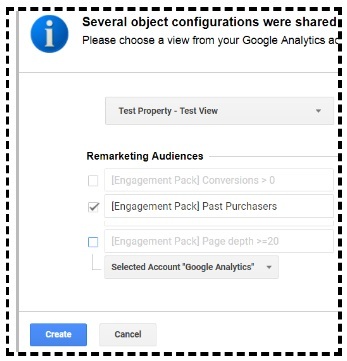 If you want to create Remarketing Audiences in your GA property and share them with your advertising accounts (like Google Adwords, DoubleClick Bid Manager) then you would need to turn on the toggle button for ‘Remarketing’. 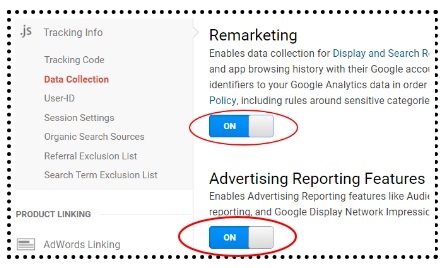 Note: Whenever you enable ‘Remarketing’, the ‘Advertising Reporting feature’ will automatically get enabled (if it is not already enabled) for your GA property. 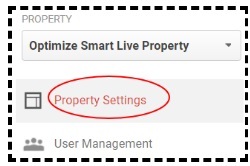 In other words, you can not enable ‘Remarketing’ setting for your GA property if you do not want to enable the ‘Advertising Reporting feature’ for your GA property. 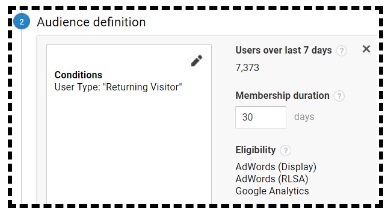 In order to use and benefit from Remarketing feature for a GA property, you would need at least one active Google Adwords account or DoubleClick Bid Manager account and this account must be linked to your GA property. 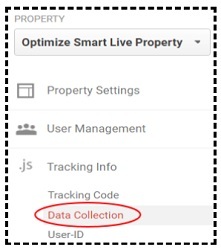 When you enable ‘Analytics Advertising Feature’, your GA property can collect data about your users from the ‘Google Advertising Cookies’ in addition to the data collected through a standard GA implementation. 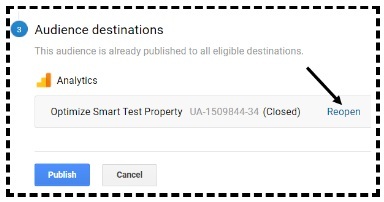 Note: In order to use and benefit from Advertising Reporting Features for a GA property, you would need at least one active Google Adwords account or DoubleClick Bid Manager account and this account must be linked to your GA property. Decide the method you want to use to create an audience in your GA property. 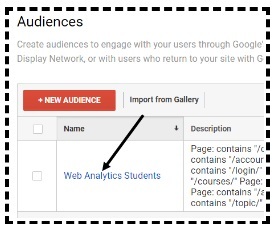 Method #1: Import the audience from Google Analytics Solution Gallery. 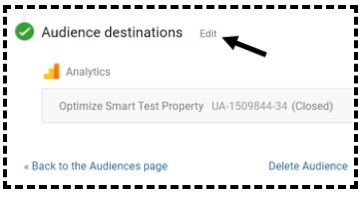 Method #2: Use the preconfigured audiences recommended by Google Analytics. Method #3: Import a predefined advanced segment and use it as an audience. Method #4: Create a brand new audience from Scratch. Step-1: Login to your Google Analytics account and then navigate to the ‘Admin’ section. 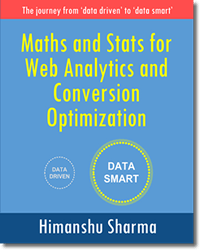 #1 Smart List – group of users who are most likely to convert in subsequent GA sessions. This audience is managed by Google using a machine learning algorithm. #3 New Users – group of users who have triggered only a single GA session on your website or mobile app. #4 Returning Users – group of users who have triggered more than one GA session on your website or mobile app. 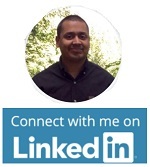 #6 Users who completed a goal conversion – group of users who have completed non-transactional goal on your website. #7 Users who completed a transaction – group of users who have completed a transactional goal on your website. It includes any user with more than zero transactions attributed to him. 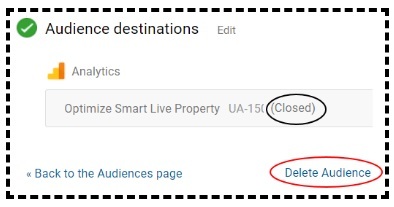 Step-2: Click on the ‘Audiences’ link under ‘Audience Definitions’ in the ‘Property’ column. Step-8: Click on the ‘Publish’ button. 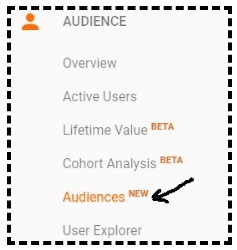 Step-3: Click on the ‘New Audience’ button. Step-5: Select the ‘segment’ you want to import from the segment list. Step-6: Change the membership duration, if required. Step-7: Enter the name of your new audience and then click on the ‘Next Step’ button. Step-8: Select the destination where you would like to publish your audience by clicking on the ‘Add Destination’ drop down menu. Step-9: Click on the ‘Publish’ button. The Lookback days option denote the number of days for evaluating the behavior that qualifies users to be added to your audience provided they start a new GA session on your website after you create the audience. 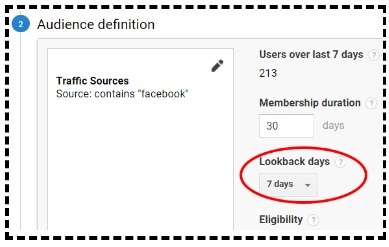 For example if you set the lookback days to ‘7’ then any user who came to your website from Facebook (see the screenshot above) in the last 7 days would be eligible to be added to your audience provided they start a new GA session on your website after you create the audience. Note: You can set lookback days to 7, 14 or 30 days. Step-8: Enter the name of your new audience and then click on the ‘Next Step’ button. Step-9: Select the destination where you would like to publish your audience by clicking on the ‘Add Destination’ drop down menu. Step-10: Click on the ‘Publish’ button. 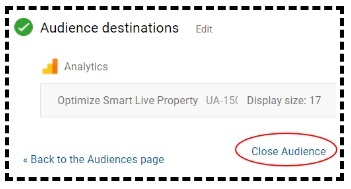 Note(1): The Audiences report in Google Analytics only show data for the audiences whose destination has been set to ‘Google Analytics’ (i.e. Analytics audiences). 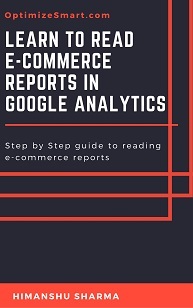 Note(2): The Audiences report in Google Analytics does not collect retroactively i.e. 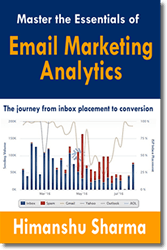 data for an audience is available in the report starting from the date you publish the audience to Analytics. Note(3): You can create maximum of 2000 audiences per GA property. However you cannot create more than 20 Analytics audiences per GA property. Note(4): If your audience includes sequences then you cannot publish that audience to Google Analytics. Step-4: Click on the ‘edit’ link next to the ‘Audience source’ to change the GA view used for collecting audience data. Step-5: Click on the ‘edit’ link next to the ‘Audience definition’ to change the conditions/criteria used for collecting audience data. Step-6: Click on the ‘edit’ link next to the ‘Audience destination’ to change the destination for collecting/sharing audience data. When you close an audience, it no longer add users. You can close an audience for individual destinations or close an audience for all destinations at the same time. Note: If you want to delete an audience, you would first need to close it. You can reopen an audience in GA. 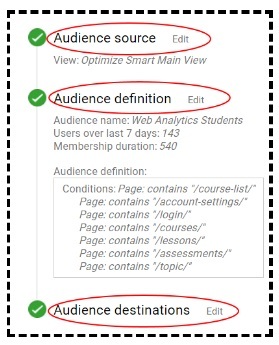 When you do that, the re-opened audience again start adding the users which meets the predefined criteria. Note: When you delete an audience, it is removed from all destinations. An audience which is used for remarketing purpose is called ‘Remarketing Audience’. 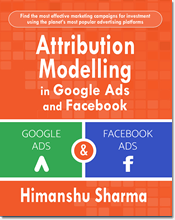 An audience which is published to Google Adwords or DoubleClick bid manager is a remarketing audience. An audience which is published to Google Adwords or DoubleClick bid manager in addition to Google Analytics is also a remarketing audience. However, an audience which is published only to Google Analytics is not a remarketing audience.